Vancouver has had an unseasonably cold spring. Usually by now we are seeing fairly consistent sunshine and the afternoons and evenings have become a bit balmy. Instead, we have had temperamental rain, very cool temperatures over night (close to freezing!) and even if the sun is out and seems warm, if you step into the shade, you will shiver. This kind of weather is crummy when you’re ready for some heat and you want to see and feel the world thaw a bit. The one thing that this weather is good for is baking. Occasionally you just want to whip up a batch of cookies or a quick loaf and when the weather gets warm, that starts to seem like a bad idea. If it’s still baking temperature where you are, give these humble beauties a try. They are soft, chewy, and fragrant with cinnamon. Don’t love cinnamon? Dial it back to just a pinch. 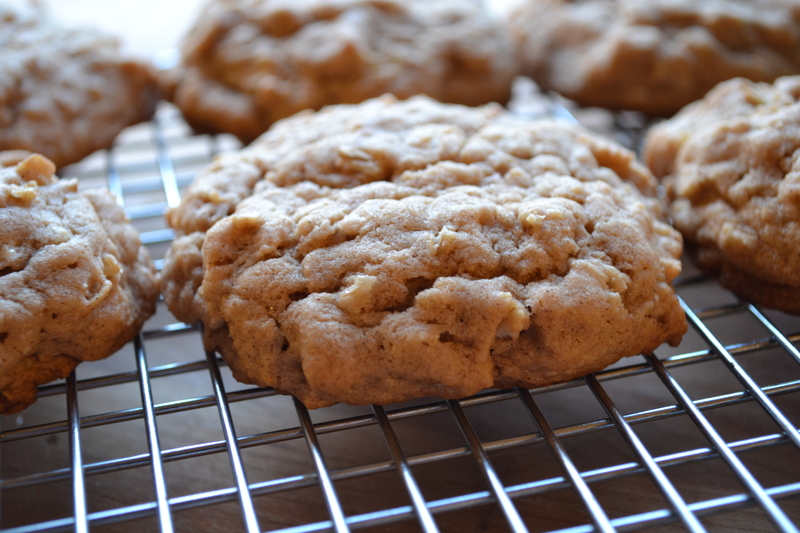 Prefer your oatmeal cookies with a smattering of raisins? Chocolate bits? Chocolate covered raisins? Toss them in! Jazz them up or leave them plain and simple – either way, they are worth trying before it’s too warm to imagine turning on the oven. In a large mixing bowl, cream the butter and sugar. Add the egg and mix well to combine. Add the vanilla and almond extract. Stir well. In another bowl, combine the flour, baking powder and spices. Incorporate the dry ingredients into the wet ingredients. Once fully mixed, stir in the oats. Drop my rounded teaspoonfuls onto a greased baking sheet. They will spread to be about 50% wider than their original diameter, so leave plenty of room. Bake for 14 minutes. Allow to cool on the baking sheet for 3 minutes before transferring to a wire rack to cool completely. Makes 16 – 20 cookies, depending on how “rounded” your teaspoonfuls are.